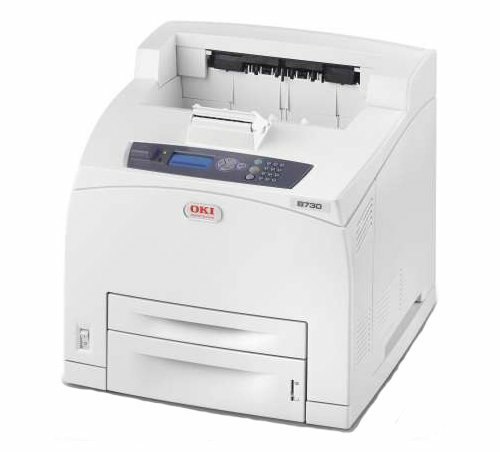 With LED technology, the Oki B730dn is an efficient and reasonably fast printer that can lower energy consumption and increase productivity, especially when dealing with high volume output. Its paper capacity is abundant and the costs per page are low, but the text and graphics quality tend to be sub-par. The absence of colour makes it inefficient for those who need to print brilliant and more detailed graphics. It weighs 23.2Kg and measures 404mm tall, 422mm wide, and 572mm deep. The Oki B730dn looks boxy with a plain, industrial-style frame, but it packs a punch with a 128MB RAM, an innovative LED print engine, and 600MHz processing speed. It has high-speed USB 2.0, Ethernet, and a parallel port as standard connectivity. It is easy to programme on-board due to the minimalist control panel with a small display screen. The abundant paper capacity helps save time. The Oki B730dn prints in speeds of up to 50ppm in A4, with the first page ready in eight seconds. Network connectivity and duplexing are standard. Direct printing from a host USB is supported. The memory is upgradeable to 640MB, and the flash memory can be increased to 1GB. Up to 30 users can share the Oki B730dn. The operating noise of the Oki B730dn is at 66dB, which can be disruptive. The quality of text and graphics, especially when they are originally in colour, becomes sub-par. The photo quality is below average as the Oki B730dn is unable to replicate details in bright areas. Banding may occur in some monochrome photographs.